Dear N Scale Customers: We were at the Denver N Scale Collectors Show a wek ago and here is images and information re the current product we will have available on a very limited quantity for our cusotmers. Back when the Railroads had more interest in their image to the public, they spent a lot of time and effort on eye-catching paint schemes to raise awareness in the public's mind when it came to choose a travel partner, or a shipping agent. Since the industry has changed (no more passenger or parcel service on the railraods), those days are gone. Well, here's a really big "What IF?" What if the colorful railroads of the past survived merger fever, and were still around today? 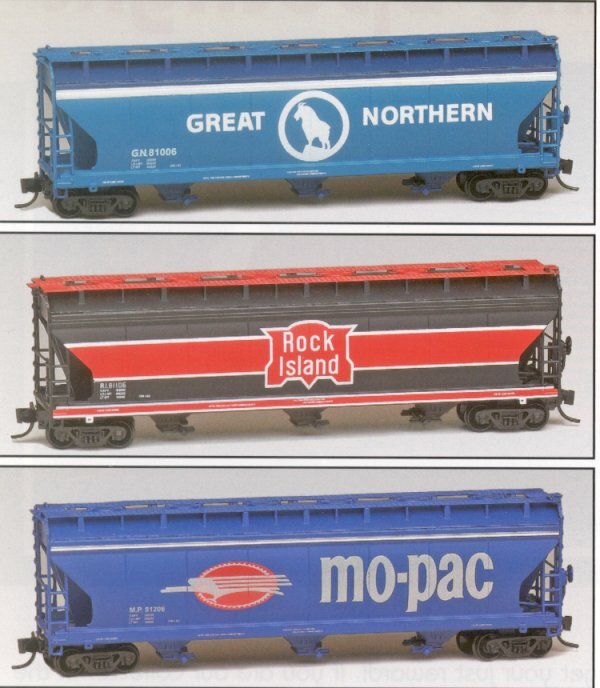 Two of the most desired engine paint schemes of the Burlington Northern Railroads and Santa Fe Railroad are showcased on our models. The Burlington Northern "Executive" dark green, cr?me with thin red stripe is captured on one covered hopper while the 2nd hopper has the Santa Fe 'War bonnet" with silver, bright red with thin yellow and black stripes. Both paint schemes were occasionally painted on various diesel engines during the past 20 years. Railroad yards throughout the United States are seeing more and more of the very colorful BNSF Speed logo embellished on the sides of freight cars. 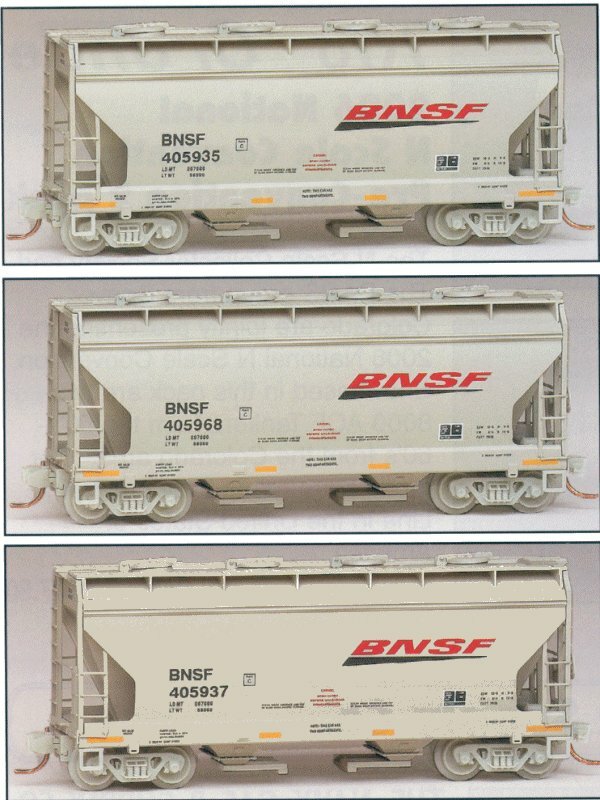 Our model depicts a 2-Bay ACF Center Flow Covered Hopper of which the BNSF has many of. The slanted logo in orange with it's black underscore gives the impression that this is a fast moving freight which is definitely "On the Move". Where ever the track and the B&B gangs go, they have to have a supply of clean, potable water for cooking and bathing. The DRG used to maintain a small fleet of ancient, second hand tank cars for the job but eventually they were condemmed by the age of their underframes, so the DRG mounted the still sound tanks on flats or bulkhead flats. Seeking to get rich quick, prospectors flocked to Colorado seeking to find gold in the mid 1800's. The miners working in their sluice boxes in search of gold were hampered by a heavy black sand that kept getting in their way. Finally, someone thought to have it assayed. Surprise! It was silver! Rich deposits of this rich metal were found in many areas of the mountains and fortunes were made. Silver being malleable and ductile as well as having the highest electrical conductivity of all metals was and still is very valuable. 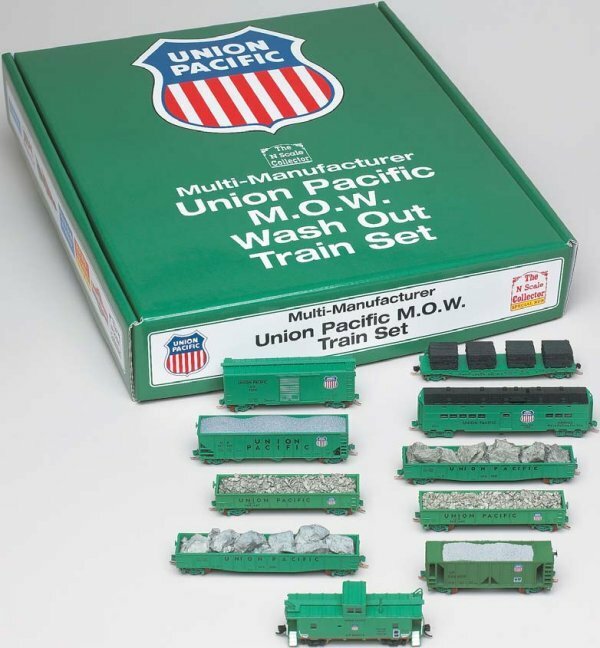 NSC, in recognition of the 2006 National N Scale Convention, commissioned Micro-Trains Line to produce The colorado Silver Mine Boxcar complete with pallets of silver bars. Original concept by Fred Hoxsie, Oil painting by Greg Karas, silver bars by Master Craftsman Dean Daughenbaugh, Dean Daughenbaugh and John Socha-Leialiha. Micro-trains reproduced the artists renderings. Silver Bar box by Gist and Herlin Press. Established by an Act of Congress on April 21, 1862, the Denver Mint opened for business as an United States Assay office in 1863. Gold and silver nuggets were brought there by miners from the surrounding area for melting, assaying, and stamping of silver or gold cast bars. Today, the Denver Mint produces high quality collector commemorative coins, as well as currency. This Limited Edition train is chock full of U.S. Bureau endorsed currency which has been officially shred. The 6th in the NSC Cityscape Trailer Series depicts a few of the memorable moments of our 14th NSC Annual Convention. DANS and NSC together presented the 2006 National N Scale Convention in Denver, Colorado. Design and artwork by fred Hoxsie, George Johnsen and Lyrob Graphics. This series compliments the Micro-Trains burlington northern City Scape series.